Circle above the Grand Canyon’s remarkable South Rim on a full-day air and ground tour from North Las Vegas Airport. Soar above the Las Vegas Valley and Lake Mead’s undulating shoreline and take in an aerial view of the Hoover Dam before you touch town in the National Park. Visit the canyon’s most iconic viewpoints on a 3-hour guided bus tour along the South Rim; stretch your legs and capture the scenery at frequent stops, then return to the airstrip for your return flight to Las Vegas. Enjoy outstanding views from different perspectives on this tour. 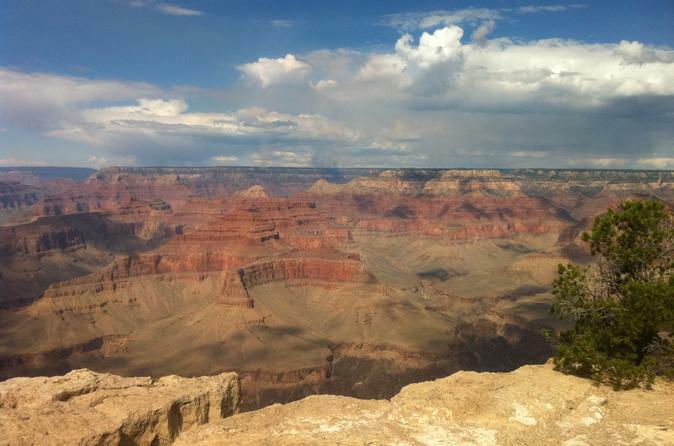 After your plane lands at the Grand Canyon, a scenic bus tour takes you to the best viewpoints. Learn all about this natural wonder and take photos you'll treasure forever!